Instant ramen is the Japanese go-to meal for a nice quiet evening where you don't feel much like cooking. Trust me on this, I've had my fair share of instant ramen nights after long days of teaching Japanese children, and it's been a lifesaver when all I want to do is eat quickly then sleep. However, with the aid of Japan based designer company MisoSoupDesign, eating a bowl of ramen is now an act I never have to enjoy alone again. 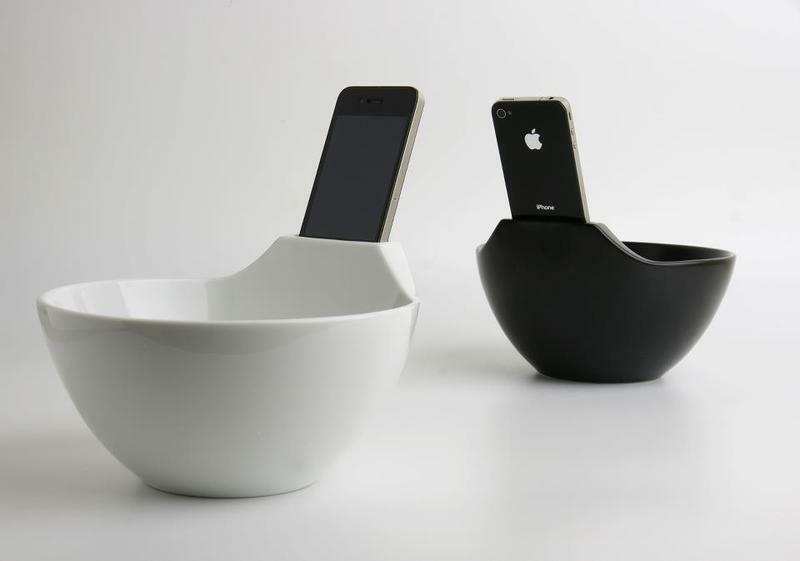 Introducing the Anti-Loneliness Ramen Bowl, a bowl to hold your favorite flavor of ramen while doubling as a iPhone dock. With a perfectly positioned iPhone docking bay at the back of the bowl, now you can plop your phone right in front of your face while eating. Turn on Skype and talk to a girlfriend while she gets an eye-full of your disgusting noodle slurping, swipe through your favorite websites with greasy fingers, or even use it to listen to tunes through the bowl's speakers. The interesting name comes from a Japanese stereotype that believes instant ramen is a meal for single men who can't cook. The iPhone is supposed to distract them from their loneliness and block their view of the empty seat across from them while they sit in their seclusion. While slightly taken aback from this silly belief, I might actually buy one of these and cook some lovely soup recipes I picked up over the years. Noodles do not seem like an ideal meal for a bowl like this thanks to another wonderful and true Japanese stereotype which states "Noodles are a messy food which splatter everywhere." I wonder if MisoSoupDesign plans to sell a year's supply of screen protectors with their product. No pricing plan or date has been announced for the Anti-Loneliness Ramen Bowl, but MisoSoupDesign has started taking pre-orders already for anyone interested.